Min Posts to send PM plugin for MyBB. In "AdminCP Configuration - Settings - Private Messaging - Required posts for sending" the required amount of posts can be added. Moderators, Supermoderators and Administrators are not affected. Users below a specified amount of posts are only allowed to read private messages, but not to send PMs. Different User groups can be allowed to send PM's without the required min. posts. Go to your "AdminCP Configuration - Plugins" and click "Install & activate" behind "Min. 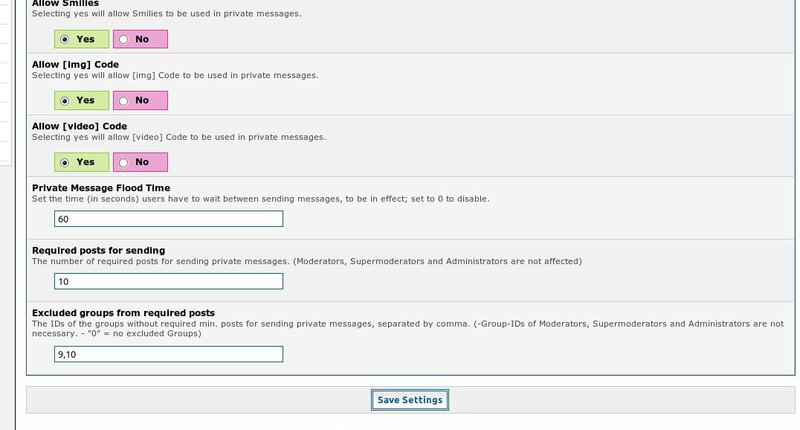 posts required to send PM"
In "AdminCP Configuration - Settings - Private Messaging" the new settings "Required posts for sending" and "Excluded groups from required posts" are added. Go to your "AdminCP Configuration - Plugins" and click "Deactivate" behind "Min. posts required to send PM". In "AdminCP Configuration - Settings - Private Messaging" below "Required posts for sending" a new setting "Excluded groups from required posts" is added.